Imogen's Typewriter. 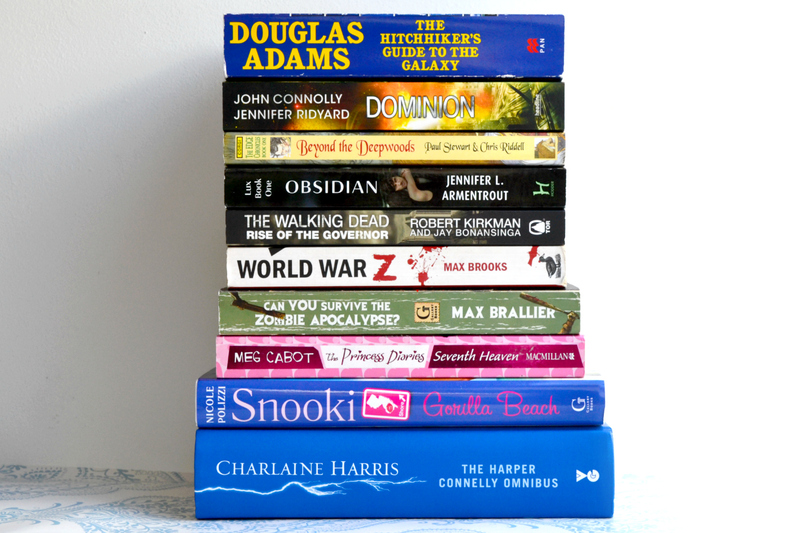 : My Summer TBR! There were a few books I didn't read in Spring that I still want to read; mainly The Hitchhikers Guide to the Galaxy by Douglas Adams, Dominion by Jennifer Ridyard and John Connolly*, and the last two books in the Harper Connolly omnibus by Charlaine Harris. So they jumped from my Spring TBR to my Summer TBR. In Spring I said I wanted to read the Discworld series by Terry Pratchett, but after my Most Owned Authors post I decided it was time to re-read The Edge Chronicles by Paul Stewart and Chris Riddell. I can't wait to revisit the world that was home when I was younger, and find out how it all ends. I've been invited down to London for a pretty cool event and Jennifer L. Armentrout is going to be there! Problem: I've never read any of her books. But I do have one. So Obsidian is top of my list. I've actually been looking for a sign to pick this up so I have high hopes. After re-reading most of The Walking Dead comics in Spring, I want to finish them and move on to re-read the novels. I've got Rise of the Governor and The Road to Woodbury, and after I read these I'm going to treat myself to the rest of the series. There's six books now, I feel like a bad Walking Dead fan for only having read two. Speaking of zombies, World War Z by Max Brooks and Can You Survive the Zombie Apocalypse? by Max Brallier are both begging for a re-read. People named Max do seem to write the best zombie books! I still have four books of the Princess Diaries series to read before I finish. I may be getting a little too old but I'm a completist and I never finished the series as a kid so I don't know how it ends. So Seventh Heaven, After Eight, To The Nines and Ten Out of Ten by Meg Cabot are going to be marathoned this Summer. Gorilla Beach by Nicole 'Snooki' Polizzi is probably the most mentioned un-read book on this blog. I wished for it, got it, talked about it, took it to Italy, but I've only read the first book in this duology. This Summer I'd like to actually read and review this book. It's getting a little ridiculous that I haven't. I'm hoping (and I'm sure I'm going to kick myself for this when it comes to me Summer TBR wrap-up) to read at least 3 books/ 1000 pages a week over Summer. I love a challenge. *I was sent this to review!